WANT TO STAY UP THE DATE WITH THE LATEST SALES, PRODUCT AND ALL OTHER GREAT THINGS? THEN SIGN UP TO RECEIVE OUR EMAILS. SCROLL TO THE BOTTOM OF THE PAGE TO SIGN UP! Personalize your own outfit. You pick the style, item and design color. And we do the rest!!!! 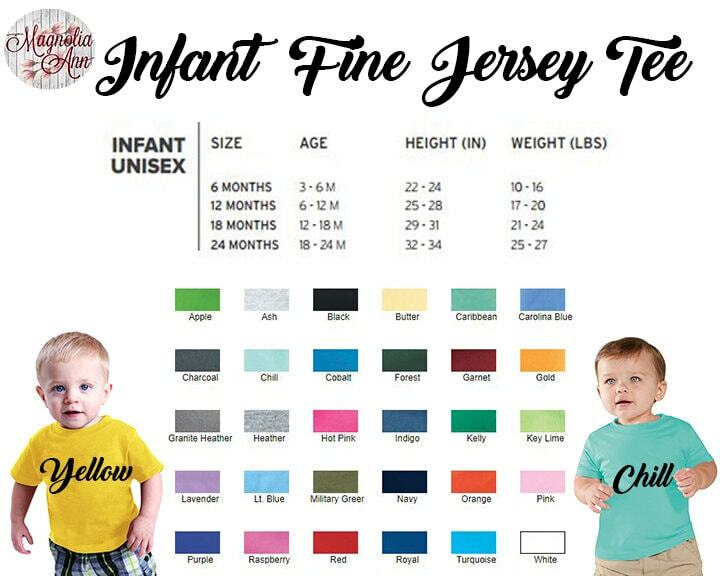 All bodysuits and tees are made of 100% combed ringspun fine cotton jersey. 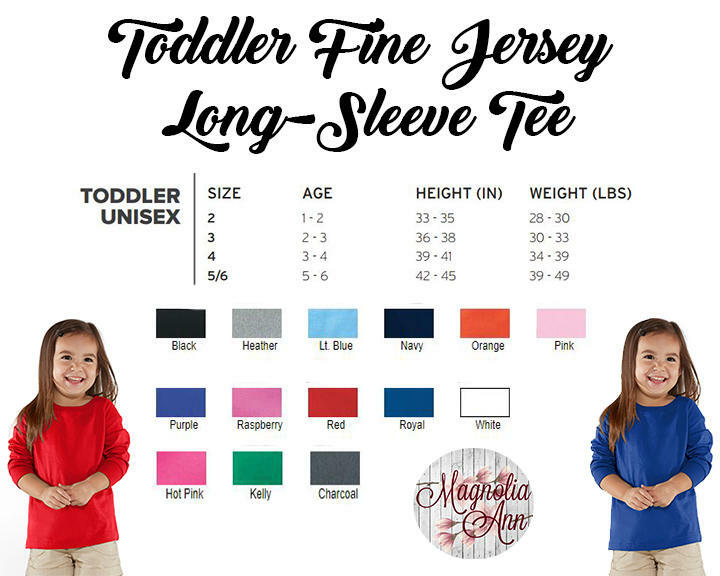 Available in tons of colors and sizes. Check out the photos for all of the size and color choices. Select in the drop-down menu. See photos for all the different styles available. 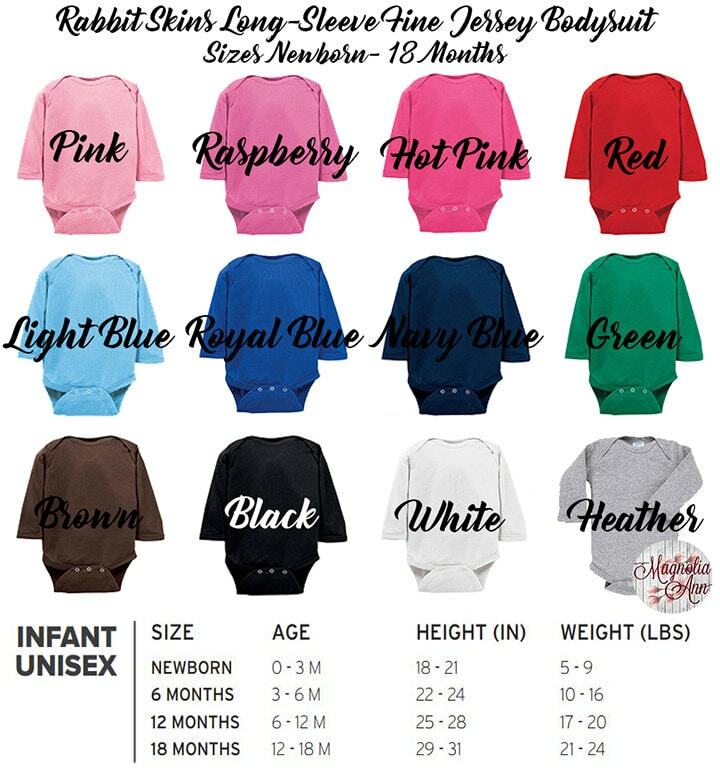 We have sizes as small as Newborn and sizes as big as a Toddlers 5/6T. Please note not every style in available in every size. We have an array of color available for each style. Please note not every item is available in every color. Please see photos for all the colors available. Add a note during checkout with what color you want us to use. 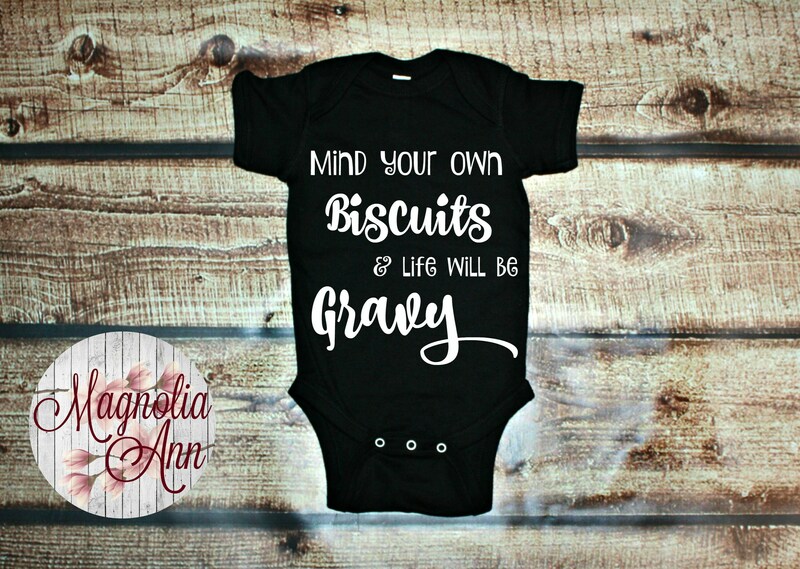 The "Mind Your Own Biscuits & Life Will Be Gravy" design is heat transfer vinyl. The design is available in numerous colors, metallics & glitters. Check out the photos for all of the color choices. 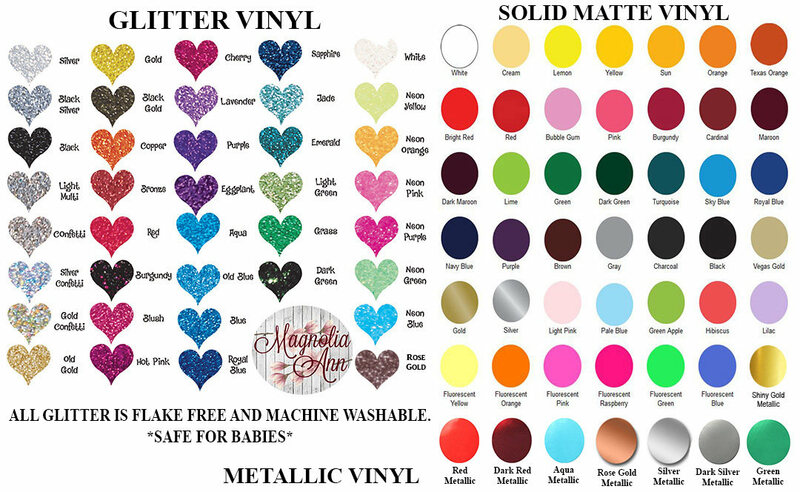 The glitter vinyl is flake free, won't shed, machine washable and very safe for baby. Add a note with what color you want us to use. -Color Design you want- We have tons of vinyl colors to pick from. 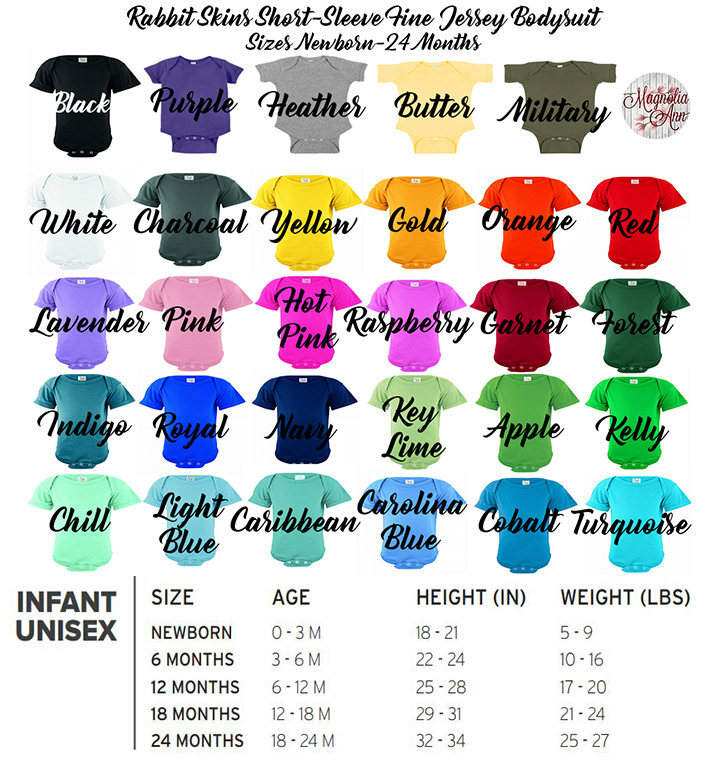 See photo for all your color choices. If no note is left, we will attempt to contact you twice within 48 hours. After 48 hours if we have still not gotten a response from you, we will make the color choices for you. CHECK OUT THE PHOTOS FOR ALL TYPES OF INFORMATION!!!! If you have any questions, please do not hesitate to ask. NOTE: Color of photo and actual product may not match exactly due to differences in monitor calibration. We make each of these items in our Marietta, GA studio with a professional grade heat press machine. Wash inside out and hang or line dry to keep the design vibrant and long lasting for years. Want to change something about the design? Need a name added? Want something custom? Just shoot us a message. We'd love to make your dream a reality. •Our items are Made to Order! •Once shipped, most domestic orders typically arrive within 2-5 business days! •Need it fast? Upgrade to Priority Shipping for a speedy delivery option! We take great care in making, packaging and shipping your item, but once we drop it off at the post office we are no longer responsible for your package and cannot control how they treat your package or the length of time it takes them to deliver it to you. Please let us know if you would like shipping insurance and we would be happy to create you a custom listing with the insurance fees. Copyright © 2018 by Magnolia Ann. All rights reserved. 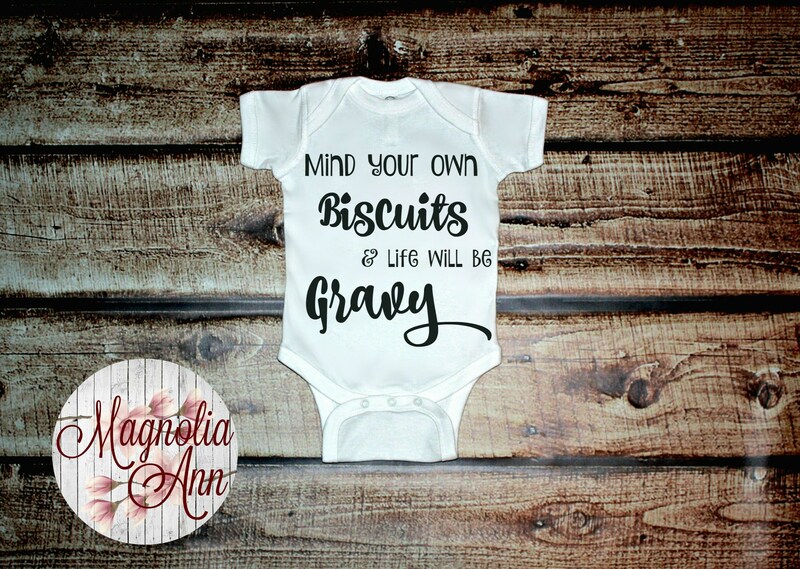 This design or any portion thereof may not be reproduced or used in any manner whatsoever without the express written permission of Magnolia Ann. Duplication of intellectual property is illegal and all infringements are subject to fines and penalties. Failure to comply will result in legal action. Do you make custom shirts? We sure do! We love making custom items. Please just message us OR email us at magnoliaanndesigns@gmail.com. If you have any pictures for inspiration send those as well. 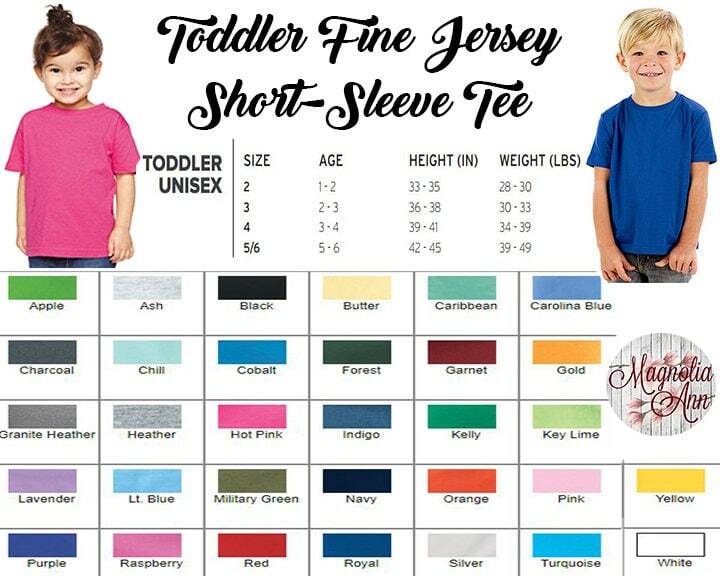 We can make shirts for women, men and children. Let us make your t-shirt dreams come true! We make each of these shirts with a professional grade heat press machine and commercial heat transfer vinyl. To ensure the longevity of your item and to keep the design vibrant, wash the shirt inside out and hang or line dry. If the design gets wrinkled, place the item inside out and press on the back of the design. Do not put an iron directly on the design. This can damage and potentially melt the design. On every listing there is a size chart in the photos. We do our best to let you know if an item runs small or not. If in doubt about what size to get we always suggest going bigger. But if you still have questions, please reach out to us. It takes time to make your item. Our current turnaround time can vary from week to week. For current turn around times please visit the main page of our shop https://www.etsy.com/shop/magnoliaann. Under announcements is where you will see the current turnaround times. When you place an order, every order receives a receipt from Etsy. On your receipt, you will have a SHIP BY DATE. That is the date in which your item will be shipped by. That is NOT the date in which you will receive your item. Shipping time for first class mail is 2-5 business days, Priority Mail is 1-3 business days. If you need it faster then please message us and we will try to accommodate your needs. A rush fee may be charged for orders needing to go out under 48 hours. Yes we do offer wholesale. You can either shop us in the Etsy Wholesale Marketplace OR send us an message. We accept returns and exchanges as long as they are in new condition within 14 days of purchase. Custom orders are NOT refundable. Buyers are responsible for return shipping costs. Please contact us if you would like to exchange or return an item. How often do you have new designs? We try our best to make new designs weekly. We love posting our designs on social media. To stay up to date, follow us on social media. Give us a "LIKE" on Facebook https://www.facebook.com/MagnoliaAnnsShop and also follow us on Instagram @shopmagnoliaann.